Traditionally, for most people, cabinets were essentially meant to be functional. These kitchen cabinets did not need to be beautiful. They came in two main styles- boxes with doors or boxes without doors. These cabinets were conveniently hung on kitchen walls and were used to hold kitchenware. Today, kitchen cabinets have evolved into diverse styles and fashions. Many homeowners have a wide variety of choice from where they can pick their ideal kitchen cabinet style that will serve their purpose. The great varieties of kitchen cabinets available at a home improvement store can be overwhelming. 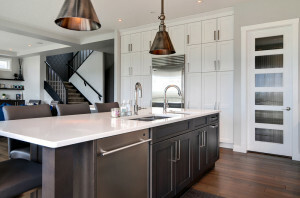 The large variety, however, ensures that different homeowners can find unique cabinets that will meet their style and personal taste. Most of these wood cabinets can be given a natural or glazed finish. White cabinets can be painted and glazed to give it an antique finish. The grain of the wood used in making these cabinets differs markedly. For example, wood from the Oak tree has a very prominent grain. However, most cabinets sold in the US are made of wood obtained from the maple tree. Kitchen cabinets come fitted with doors, which are either made of recessed or raised panels. Some kitchen cabinets are also made of flat door surfaces. The main difference between these kitchen cabinet styles is whether the doors are raised above the level of the center frame or recessed below it. White and black cabinets are the best fit for most homes. This is because of the flexibility they allow home users when choosing the styling for the doors and the knobs that help them blend easily with any décor an interior finishing of any kitchen. The knobs serve a dual purpose; they help in opening and closing the cabinet and also protect the wood of the cabinet from dirty and wet hands that can easily stain the wood. Homeowners are highly advised to choose a kitchen cabinet style that will not only complement their kitchen interior design but also combine beauty and functionality. Bow Valley Kitchens has a wide variety of kitchen cabinet styles from where homeowners can make their pick.